The following instructions apply to the next version of the Akismet account dashboard, which is being rolled out incrementally to our user base. If your dashboard does not mirror the screenshots and steps below, please follow this guide instead. 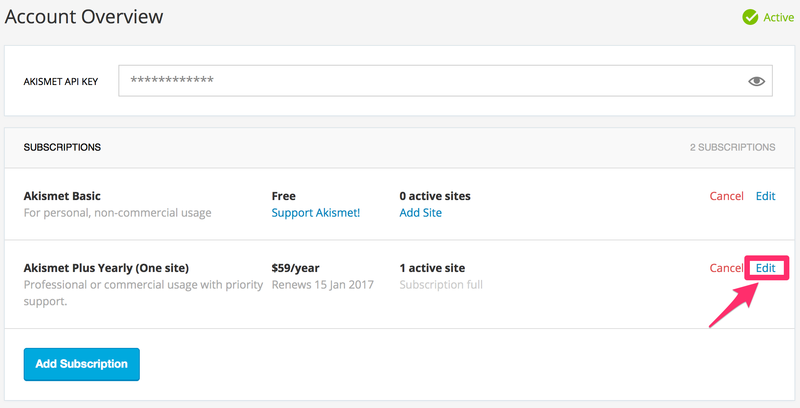 If you have an Akismet Plus subscription, you can add sites to it at any time via your account dashboard. Because Plus subscriptions are per-site, you will need to update it as necessary to support the number of sites with which you would like to use the subscription. Once you log in to your account and locate your Subscriptions section, click on the Edit link to modify your Plus subscription. Use the Number of Sites drop-down menu to select the new number of sites that you need to cover with this subscription, and click on the blue Save Changes button. The modal will change to let you know that the subscription is being updated and will disappear as soon as the update is complete. Personal sites (as well as testing and staging sites) do not need to be covered by your Plus subscription. You can simply add a new Basic subscription to your account by clicking on the blue Add Subscription button (also pictured in the above screenshot). How do I log into my Akismet account? How do I remove inactive sites from my Akismet dashboard?